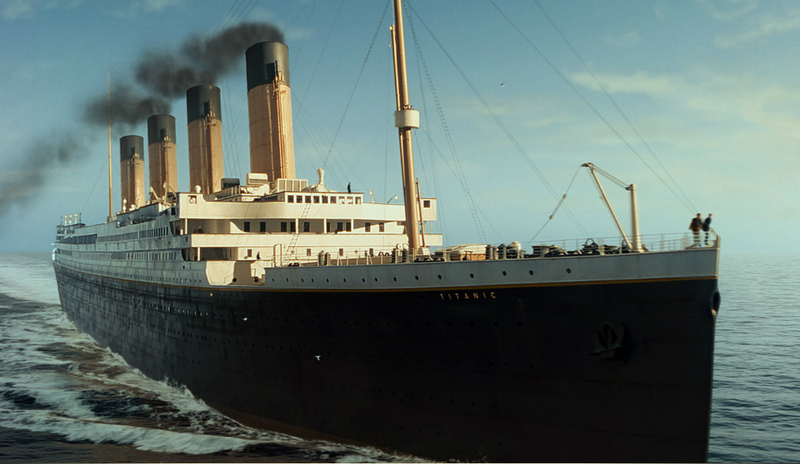 Titanic is responsible for exposing me to what is very likely my first experience with the phenomena of backlash toward something popular. Though I was just 11 when the film first released back in 1997 and had very little interest in actually seeing this 3-hour epic romance, I distinctly remember getting caught up with the other guys in my class who took great joy in teasing the girls who had begun bragging that they had seen the movie multiple times and memorized every moment. I even remember writing a sort of anti-fanfic of the film that I read in front of my 5th grade class for an English writing assignment wherein I was transported into the setting of the film and took the place of Jack and Rose at the end of the ship as it was sinking, thus dooming them both to a watery grave. There was also probably some destruction of a certain famous drawing from the film and the theft of the giant blue diamond. I hadn’t even seen the film at that point, but I had heard so much about it, I basically knew all the plot points and buttons to press that would set off the girls’ tempers and win the favor of the guys. It wasn’t until I spent the night home alone and had borrowed the movie from a family next door who I babysat for some time after the film’s 2-cassette VHS release that I finally sat down and watched Titanic in its entirety. Imagine my surprise when I actually managed to enjoy the film. In fact, I enjoyed it so much, I actually ended up borrowing the film multiple times from my family’s neighbors alongside their copies of the Star Wars films (thus also exposing me to those films for the first time). Being an honest guy, I even managed to make a 180 and defend the film alongside the girls. After all, the romance wasn’t so bad, the historical aspect was pretty interesting, and all that destruction in the latter half was really quite exciting, right? Well, they weren’t exactly having any of it, and, ultimately, I not only got teased by the other guys for liking a girl movie, but also got teased by the girls for… well, pretty much the same thing. And here I am, 15 years later and still defending the film against those who completely dismiss it based solely on the fact that, yes, it was indeed overhyped Hollywood schmaltz at its heart. But, dammit, it was fine entertainment, all the same, and I still kind of find myself tempted to buy the Blu-Ray every time it reaches the $15 mark, as I feel it’s just one of those things that I need to have in my collection as an amateur film critic. Alas, the stigma (and expense compared to other more desirable/necessary things) continues to dog me, and I settled for having the film delivered to me by Netflix. Heck, I didn’t even go see it in 3D re-release last year, despite really kind of wanting to. 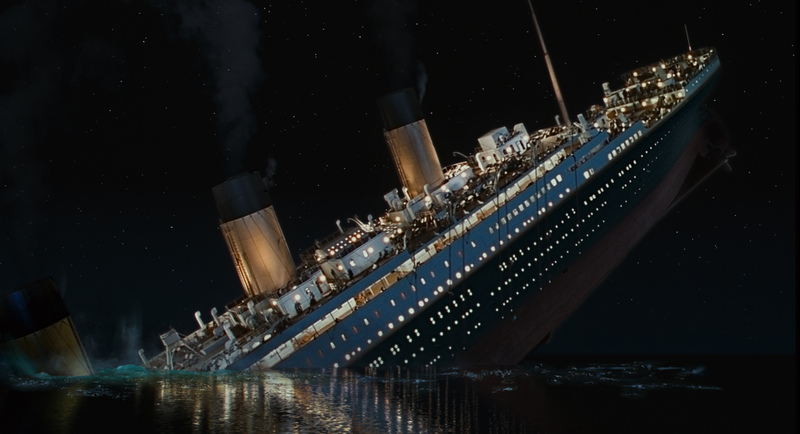 It isn’t that Titanic is the greatest film of all time, or anything, though. 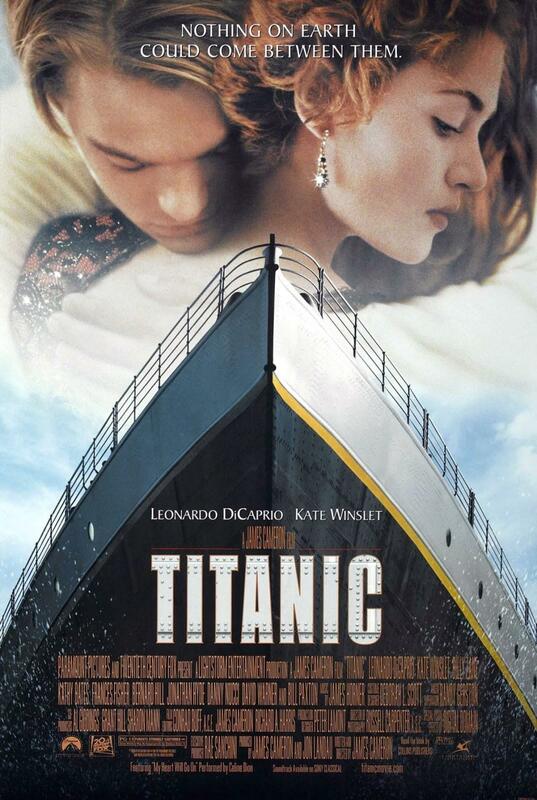 It’s certainly one of the most overrated films you’ll see if you’re one to compare quality to popularity, but if you can enjoy a reasonably engaging romance story mixed with some Hollywood special effects and are able to sit still for quite a while, you’re probably going to enjoy Titanic just fine if you just give in to it. Sure it was just an excuse for James Cameron to have a studio fund a voyage down to the depths of the ocean, where actual footage of the wreckage was captured for use in the actual film, but of all the directors out there who could do well by the promise of delivering something worth watching in spite of this, it was James Cameron, a notorious perfectionist and someone who knows a thing or two about making the studio system work in harmony with an artistic vision, even though this usually meant that he was being a tyrant on the actual set. 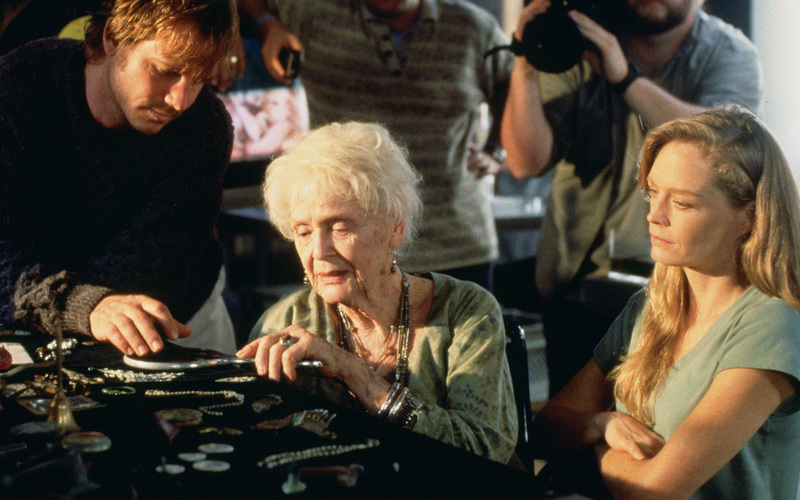 Told in flashback by an elderly woman, Rose (played by Gloria Stuart) – who recognizes on the news a drawing of herself when she was a young girl aboard the doomed ship – the meat of Titanic’s story deals with her forbidden romance with a young man from steerage named Jack Dawson, won his place on the ship in a risky card game. And while we are led to believe the two were meant for one another, Rose was already the fiancée of Cal Hockley, a smug man several years her senior who happens to be the heir to a considerably successful steel enterprise. Rose was not happy with these arrangements, naturally, and considered ending it all by tossing herself over the edge of the ship and into a watery grave – that is, until she meets Jack, who coaxes her from the edge and convinces her that life is still worth living, even when all hope seems to be lost. A woman’s heart is a deep ocean of secrets. 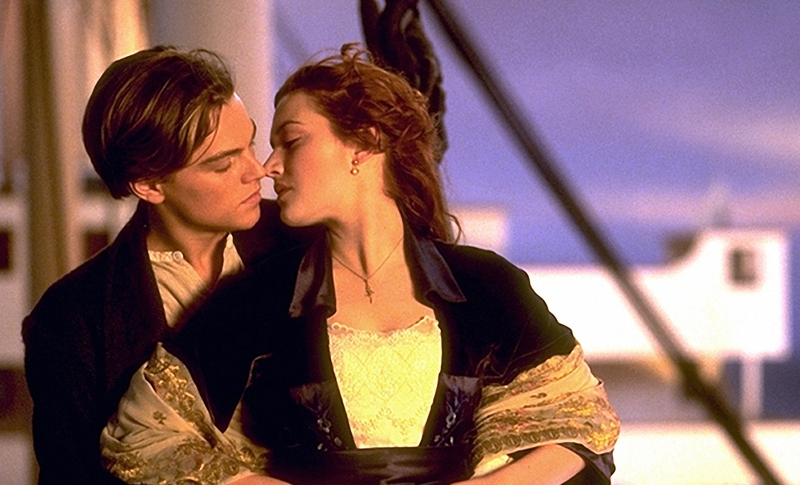 But now you know there was a man named Jack Dawson and that he saved me… in every way that a person can be saved. I don’t even have a picture of him. He exists now… only in my memory. But it’s still all quite enjoyable, if not entirely original (yet another riff on the old Romeo and Juliet story), and even once the ship strikes the iceberg and begins to sink, the film manages to keep the romance front and center and still fairly engaging amidst the still remarkable, though ultimately aging, special effects, with the drama and chaos of the ship’s predicament paralleling that of the plight of the two forbidden lovers, capably performed by Kate Winslet and Leonardo DiCaprio, who, despite earing an Oscar nomination for his earlier work in What’s Eating Gilbert Grape, had his adult acting career jumpstarted by becoming more widely known as a heartthrob – kinda like Ryan Gosling in The Notebook, come to think of it. Billy Zane, meanwhile, chews all the scenery he can as the film’s defacto villain, Cal. And man, is that destruction ever horrific… and yet kinda conflictingly exciting all the same. Though the presentation can often seem a bit tacky for such a tragedy by feeling a bit like a ride, Cameron’s direction and commitment, including his insistence on making the actors work in tanks of freezing water and his willingness to pull crazy stunts like dumping thousands of gallons of that water onto his actors and sets (often destroying them in the process), and his effects team’s skill in rendering this very long sequence, including their seamless use of combining rigged sets and a scale model for the ship’s splitting in half and sinking, are nothing short of exemplifying the kind of jaw-dropping spectacle you can often only hope to see in films this ambitious. Though, again, it kinda feels guilty enjoy it so much, even if it’s now a 101 year old incident. I guess that’s the thing about the film, though – it’s like the ultimate in guilty pleasures. But how much of that is based on the stigma of the backlash and how much of it is based on legitimate quality issues? For me – and, as a convert, you hopefully know I’m saying this with all honesty – it’s mostly about the legitimate quality issues. There’s a small part of me that still wants to wail on the film and dissect its corpse and pick out all the flaws. (Remember that insidious Celine Dion song? Doesn’t matter. The sweeping James Horner score will remind you repeatedly before it plays over the credits in full!) It is a very basic rags-and-riches romance in the same vein as other mismatched romances, wrapped in a technically sound but somewhat inappropriate action/drama hybrid. And the dialogue’s not exactly lacking in the corn department, either. And yet the performances of its two leads keep the film adrift, if you will, and the film undeniably a remarkable feat of filmmaking at the very least, if only for the technical aspects. Ultimately, it’s exciting and entertaining, and even if it’s more of a Pearl Harbor than it is a Saving Private Ryan, this is ultimately the primary draw for the film – and it’s nowhere near as idiotic and loud as that comparison probably suggests. Perhaps it’s nostalgia informing my opinion of the film, but not once have I ever popped in the film on the rare occasions that I have and felt like I was wasting my time, and that’s saying something for a film that was so long that it spanned two VHS tapes and even once on one of those flipper DVDs.